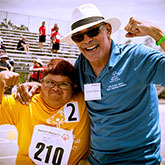 Special Olympics Healthy Athletes provides accessible information, resources, systems and policies at the individual, community, national and global levels that support Special Olympics Southern California athletes in realizing sustainable healthy and productive lives. Team Wellness is a unique health and wellness program designed for individuals with and without intellectual disabilities. Participants are led by a trained Wellness Coach and receive guidance, direction, and encouragement.